Posts 1 through 7 for Burnsville man 257 gills&79 bass over limit. 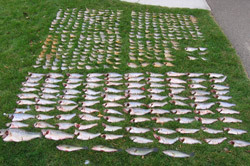 Burnsville man 257 gills&79 bass over limit. - - - 7 messages. Showing 1 through 7. He was reported by someone watching.the DNR got him.WCCO had it on the news last night. He must have been really hungry, or he just didn't have a copy of the regulations. So don't these asians know that bass taste like crap or is it carp?? This isn't all that uncommon for the asian culutre. Some don't know the laws and some don't want to know the laws. Part of the problem is the culutral differences we face. I think there needs to be more education with this population. I have seen so many keeping everything they catch regardless of size or limit.